Rory McIlroy is in a strong position to be crowned European number one for the third time in four years after two rounds of the World Tour Championship. The Northern Irishman shot a four-under-par 68 at Jumeirah Golf Estates to lie eight under, four shots behind the halfway leader, Andy Sullivan. The Englishman carded a 66 to lead by one from Argentina's Emiliano Grillo. McIlroy leads Race to Dubai rivals Justin Rose and Danny Willett by one and two shots respectively. World number three McIlroy has a lead of only 1,613 points over Englishman Willett, with compatriot Rose more than 600,000 points further back and needing to finish second or better to have any chance of taking the end-of-season crown. Even victory on Sunday in the £5.2m finale to the season would not be enough for Rose if McIlroy was outright second. Sullivan, who shared the overnight lead with Ian Poulter, is the only player to win three times on the European Tour this season and could take his earnings for the year to almost £2m with the first prize of £875,000. "It's absolutely awesome to be leading after halfway in such a massive event," the 28-year-old said. "I'm just happy I'm doing it in front of my fans to keep them happy for the weekend anyway," said Sullivan, who is being cheered on by 30 supporters from his club in Nuneaton. "They have followed me about six or seven times this year and every time they have been there, I've done pretty well. "I think I am going to have to start paying for them to come out every week now." 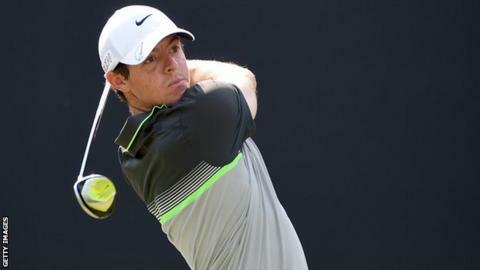 McIlroy said he was "not quite performing at the highest levels" despite closing in on the European title. "I still missed a few chances but I scrambled well today," he said. "All facets of my game are pretty much there. It's just a matter of being a little more efficient, taking advantage of the par fives a bit better. "I saw first hand how well Emiliano is playing but I just have to try and put another solid round in tomorrow and give myself a chance on Sunday." Playing alongside McIlroy, Grillo carded eight birdies in his 64 - the lowest round of the week - to maintain the form which saw him win two titles in two weeks in October. "It gives you a lot of confidence," said the 23-year-old, who almost hit McIlroy with a tee shot on his way to winning the Frys.com Open, his first PGA Tour title. "Here it's pretty much like a major. You've got the best players in the world and you've got to play really well to keep it up." Rose is five shots off the lead after adding a 66 to his opening 71 to move to seven under par. Former Masters champion Charl Schwartzel and Thongchai Jaidee are alongside McIlroy on eight under, with American Ryder Cup star Patrick Reed a shot further back.